Francis Ford Coppola’s masterful thriller forms an important part of his incredible run of films during the 1970s. Surveillance expert Harry Caul (Gene Hackman) is recruited to track and record a young couple (Cindy Williams and Frederic Forrest) in San Francisco’s crowded Union Square. A loner by nature, he gradually begins to suspect the motives behind the man who hired him to do the job (Robert Duvall) and becomes obsessed with a piece of audio that may (or may not) hold the key to his concerns. Beginning with a stunning opening sequence that is a master class in cinematography, sound and editing, this is a slow-burn film about paranoia and technology, whose relevance has only increased over time. Back in the mid-1970s it seemed eerily prescient as the Watergate scandal unfolded around the time of release and it has a new topicality now in an era where much of modern life is recorded and put online. Coppola’s other films in the 1970s were amongst the greatest of the New Hollywood era: The Godfather (1972), The Godfather Part II (1974) and Apocalypse Now (1979) are not just masterpieces of the time but also landmark films in American cinema. 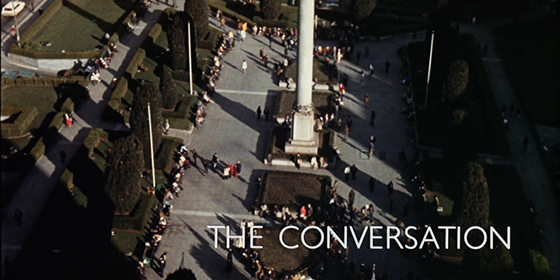 The Conversation opened in April of 1974 and although it won the Palme d’Or at Cannes, in retrospect it has always been overshadowed by the success of The Godfather sequel, which opened around Christmas of that year. At the 47th Academy Awards, both films competed against each other, with his gangster epic becoming the first sequel ever to win Best Picture. An extraordinary feat, the only downside was that The Conversation has slightly suffered in retrospect, which is a shame as it reveals as much about power as the Godfather films did. Gene Hackman gives one of his greatest performances as a haunted man who knows only too well that the technology he employs to snoop on people can be used against him. Methodical yet dignified, he creates a compelling protagonist in a role which in other films would be the part of the token technical geek, but here becomes something else. Coppola and Hackman combined to show that it is often the technical people who wield the real power and responsibility in society, and the unbearable tension this can create inside of them. Other roles are expertly cast: look out for a young Harrison Ford as the sinister assistant to Robert Duvall; Jon Cazale as Hackman’s assistant and Teri Garr as the distant girlfriend. But the real stars of the film are behind the camera and repeat viewings reveal the masterful technical work by Coppola, DP Bill Butler and editor/sound designer Walter Murch. Coppola was heavily influenced by Antonioni’s Blow-up (1966) and wanted to do for sound recording what that film had done for photography. 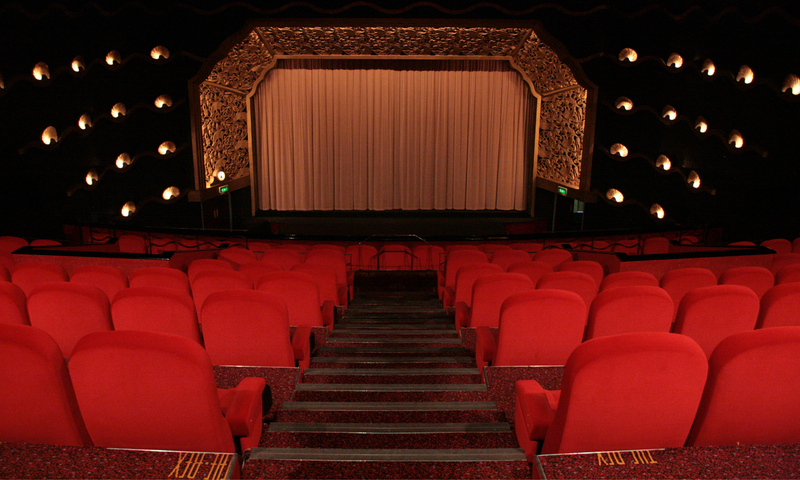 Featuring one of the most intricate and accomplished sound designs of the 1970s, Murch really cemented his reputation with some stunning work on this film as supervising editor and sound designer. Not only are the sounds we hear crucial to the plot, but the overall construction creates a sense of uncertainty which effectively lends us the ears of the central character. Coppola made sound an integral part of the narrative and in some ways laid the ground for the innovations on Apocalypse Now, which was effectively the first film to have a 5.1 surround mix. On the Bu-ray, the uncompressed audio is a joy to behold and gives it the carefully crafted sound mix the attention it deserves. In fact this disc offers the film’s original mono track in lossless DTS-HD Master Audio 2.0, but also a lossless DTS-HD Master Audio 5.1 mix, which has been crafted with considerable care and attention (this is probably down to the fact that Coppola still co-owns distribution rights to the film). David Shire’s restrained but haunting score also adds to the melancholy mood and sounds wonderful in the new mixed audio. The visuals are another story. Originally Coppola hired Haskell Wexler after his pioneering work on Medium Cool (1968) but they soon fell out after completing the opening sequence. San Francisco provided a memorable backdrop for Hitchcock’s Vertigo (1958) and Coppola seems to play on that film’s themes of obsession and cruelty. He also draws on some of the subjects explored in The Godfather films, such as Catholicism, crime and power, despite the different period and context. The transfer here may appear grainy at times but as Coppola explains in the commentary track, he wanted to use different film stocks and zoom lenses in order to give the film a verite vibe and the feel of a surveillance video, which explains the odd camera movements at certain moments. Other than that, it looks great with the colours, clarity and contrast looking great and as good as it ever has in the home. At the time there was a lot of press speculation that the bugging technology used in the film was similar to that used in the Watergate break-in, even though Coppola admitted that this was coincidental. But this fact reveals the film’s lasting power as a parable for man’s manipulation of tools in order to achieve certain ends: then it Nixon sanctioning the illegal bugging of political opponents; in recent years, it was Bush signing the Patriot Act to snoop on citizens. So despite the period setting, the core themes give it a lasting relevance and there’s much that happens that makes it ideal for home viewing, with many elements not immediately apparent on a first watch. Keep your eyes and ears open for the use of colour, musical motifs, carefully written dialogue and the surprising sympathy we feel for the central character. We come to connect with a professional eavesdropper who becomes vicariously involved people he’s never met. Isn’t that a brilliant metaphor for watching a movie? Feature Commentary with Writer-Director Francis Ford Coppola: An outstanding audio commentary, filled with useful detail, in which Coppola provides the context for the film and his specific influences and aims. He covers an impressive range of subjects including casting, filming and editing with his usual insight and intelligence. 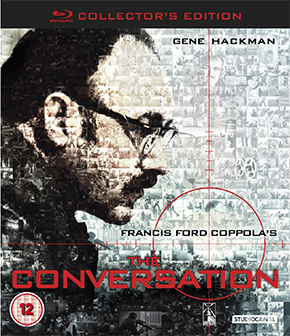 Close-Up on The Conversation (8:39): An archive promotional featurette showing Coppola and Hackman on set. Cindy Williams Screen Test (5:02): This shows the actress reading for the part that actually went to Teri Garr. Harrison Ford Screen Test (6:45): Ford’s audition for the part that Frederic Forrest ended up playing makes for an interesting ‘what if’ clip. “No Cigar” (2:26): A short 1956 student film by Coppola, which the director feels was an early influence on the character of Harry Caul. Harry Caul’s San Francisco – Then And Now (3:43): A slideshow look at several locations from the film as they were in 1973 and as they appear now. David Shire Interviewed by Francis Ford Coppola (10:57): Shire talks about scoring the film and how important music was to setting the film’s melancholy mood. Archival Gene Hackman Interview (4:04): An interview with Hackman on the set of the film. Script Dictations from Francis Ford Coppola (49:23) Great audio feature where Coppola dictates the screenplay, playing along to typed versions of the pages and clips from the film.